The origin of CCTV (Closed Circuit TV) dates back to the 1950's. Advancements in the 1970's with analogue recording systems and solid state cameras moved surveillance from concept to reality. CCTV technology has now reached a point where computer software can identify suspicious behavioural patterns, facial recognition software can identify individuals, and ANPR (Automatic Number Plate Recognition) systems can read vehicle registration numbers. CCTV is invaluable for helping to detect different types of crime such as anti-social behaviour, theft, criminal damage and for evaluating stored images as an investigative tool. However, a badly installed system may be of little use for evidential purposes if the wrong type of equipment has been selected, or located without proper consideration to detail. 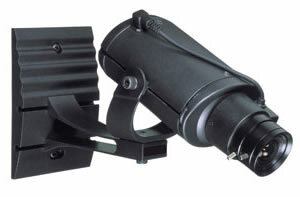 Cameras can be subject to environmental problems such as reflected sunlight or left prone to attack due to positioning. There are many factors to consider when designing and installing CCTV systems and this is where Laser Security can help. 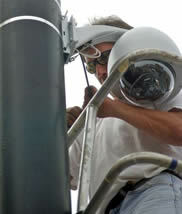 Laser Security has many years experience designing installing and maintaining CCTV systems. Working closely with the client, we will design a bespoke system using quality components and install them to a high standard thus providing our customers with the peace of mind that a well designed system affords them. There is a dizzying array of cameras, lenses and of course prices. Some cameras have the ability to pan, tilt and zoom while others are static. Our top end cameras can see in varying low light conditions, or even in total darkness while low to mid range cameras often use infra red lamps or integral LED’s to aid them at night. Laser Security can supply all types of cameras besides the traditional style, such as dome cameras, bullet cameras, IP (Internet) or even helmet and body cameras. We can transmit images over computer networks, radio, infra red or microwave. Of course, cameras are only part of the system. Advances in technology means that we no longer need to use VHS recording systems that produce grainy images. These days we rely on digital video recorders (DVR) that produce a superior image quality combined with features such as motion detection, and simultaneous recording of all cameras so no event can be missed. In addition there are no tapes to change as recordings are stored on a hard drive similar to that found in any computer. In fact with the relevant software and hardware we can even use a computer as a DVR. Should you need to save an event for evidence then the recorded images can be saved to a PC, CD or DVD disk. In addition, you can interrogate and view recordings remotely over the internet using a PDA, laptop computer or even via a 3G enabled mobile telephone. Our CCTV systems are digital rather than analogue, and can be integrated with other systems such as access control. 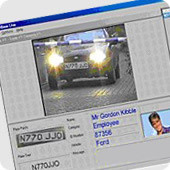 One example would be to read the number plate of an approaching vehicle using ANPR to validate the vehicle and open a barrier or gate, thus eliminating the need for the driver to manually identify themselves via the traditional method of presenting a card, fob or having to insert a code number to gain entry or exit. Other uses for CCTV may be of interest to hire shops or vehicle rentals. Recording a hirer’s image at the point of transaction may be necessary to confirm the identity should a hirer use fraudulent documents. As can be seen, there are many instances where CCTV can protect a home or business and Laser Security is here to help you determine the best system to suit your particular needs.